Low carb cheesy chicken and rice is a delicious low carb lunch option! 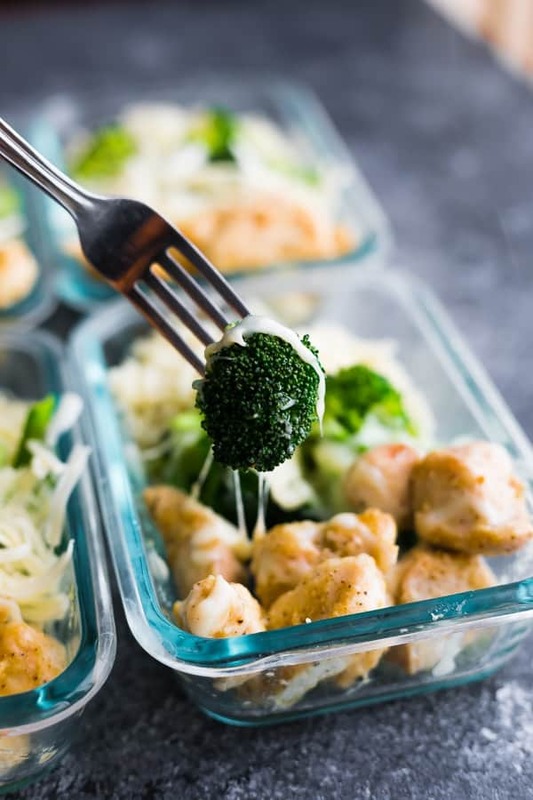 Pan-fried chicken breast and broccoli are smothered with cheese and served over cauliflower rice. Filling but light with only 5 g carbs and 43 g of protein. One thing is clear: healthified versions of your favorite comfort food is never a bad idea. In the past month we’ve enjoyed Lighter Mongolian Beef, Slow Cooker Honey Garlic Chicken Thighs, and Healthier Firecracker Chicken. Today I’m moving on to chicken and rice…because what is more comforting than chicken and rice? Not only is this chicken and rice recipe healthier, but it is low carb, with only 5 g of carbs in the full recipe. But I’m guessing you’re going to be nice and full, since there are 43 g of protein to keep you feeling satisfied! How to make low carb chicken and rice? I’m pretty sure you’ve guessed by now that we’ve swapped regular rice for cauliflower rice for this recipe. This squeezes extra vegetables into your diet and cuts the carbs down significantly. Broccoli- which you can totally swap out for your favorite vegetable (pick one with a low water content if you want this to last through the week!). I bet mushrooms, carrots, zucchini or asparagus would taste great in this recipe. Chicken- I used boneless skinless chicken breast and tossed in a simple seasoning blend with garlic powder, onion powder, salt and pepper. “Rice”- we are swapping regular rice for cauliflower rice for this recipe! 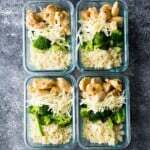 I made my own, but if you are looking to cut some prep time out, you could totally use pre-riced cauliflower. Cheese- I used mozzarella but you could really use whatever you have in the fridge! I bet cheddar would be pretty fantastic in this recipe too! Not only is this recipe delicious, but it’s easy to prepare as well! I used one skillet and first cooked the cauliflower rice, then the broccoli, and finally the chicken. Just a reminder to cook your broccoli and cauliflower rice al dente because they will cook a second time when you reheat! 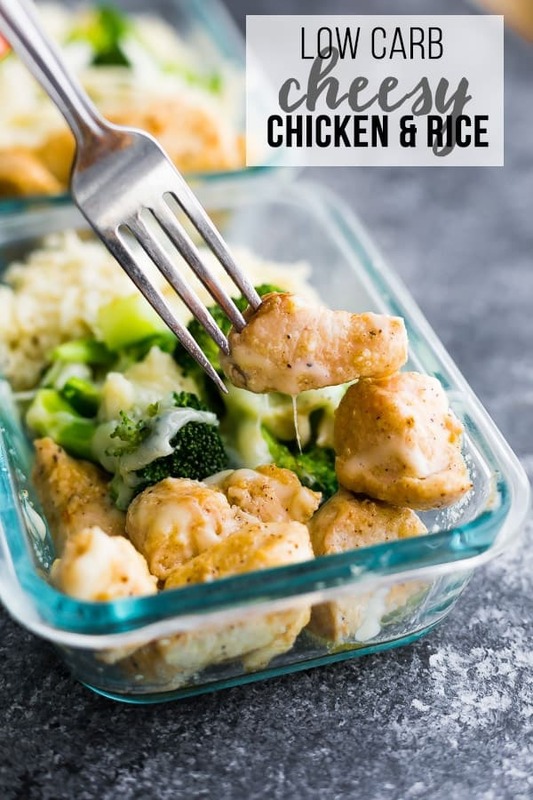 And I should also warn you that this low carb chicken and rice meal prep is not going to smell the most amazing when you go to eat it, but TRUST ME it sure tastes amazing!!! You can also use pre-riced cauliflower from the grocery store, but I don’t recommend frozen cauliflower rice as it can get soggy when thawed. 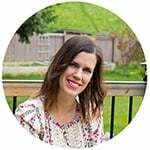 Looking for more low carb meal prep recipes? Check out this Low Carb Greek Turkey Meal Prep, these Thai Turkey Lettuce Wraps, these 7 Cauliflower Rice Recipes and this round-up with 26+ Low Carb Meal Prep Recipes! Watch the video below to see exactly how I prepped my Low Carb Cheesy Chicken & Rice. It’s so easy! You can find more of my recipe videos on my YouTube channel, or on Facebook. Make cauliflower rice: cut cauliflower into even-sized pieces. Pulse in a food processor 10-15 times or until it is broken down into uniform cauliflower rice. You can use a box grater if you'd prefer for this step! Add 1 tablespoon olive oil to a non-stick pan and heat over medium heat. Add the cauliflower rice and cook for 5 or so minutes, until slightly softened. Season with salt and pepper. Divide between four 2 cup capacity storage containers. Add another 1 tablespoon of olive oil to the pan. Add the broccoli and cook for 5-7 minutes, until slightly softened. 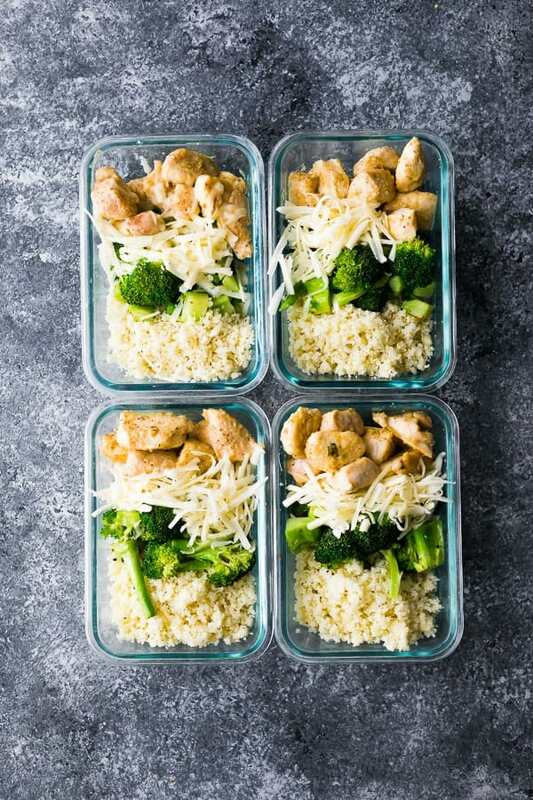 Add the cooked broccoli to the storage containers with the cauliflower rice. Chicken: Toss the chicken with olive oil, onion powder, garlic powder, salt and pepper. Cook in the non-stick pan over medium heat until cooked through; 5-7 minutes. 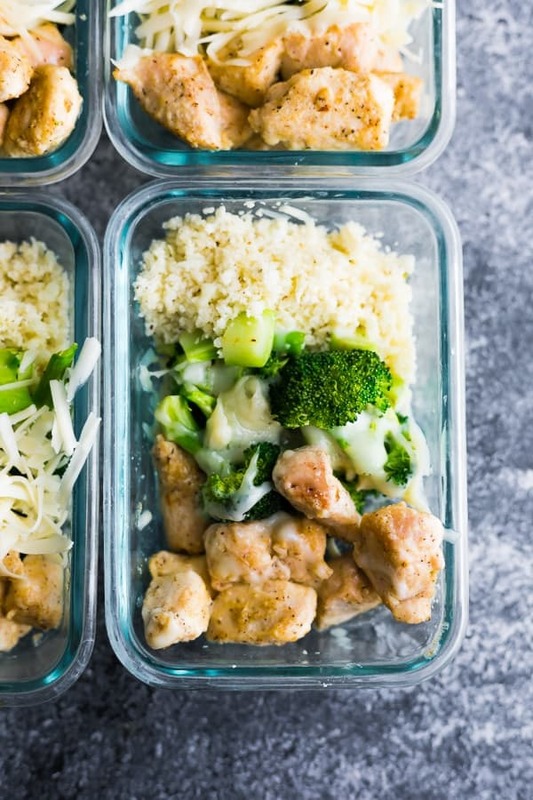 Add the cooked chicken to the storage containers with the cauliflower rice and broccoli. Divide shredded cheese between the four storage containers. Heat in a microwave until steaming hot. Stir it up and enjoy. What size are the containers you use in the video? Hi Erika! I believe it would freeze fine! Hope you enjoy!